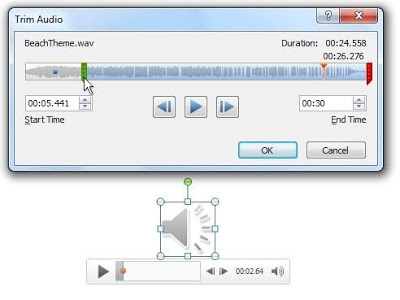 PowerPoint 2010: Trim Audio Clip – You can trim audio at the beginning and end of each clip. Perhaps, a narration discusses a subject that is not pertinent to the message of your audio clip or you want to shorten the audio to fit with the timing of your slides. Select the audio clip, and then press Play. Select the video on the slide. Under Audio Tools, on the Playback tab, in the Editing group, click Trim Audio. To trim the beginning of the clip, click the start point (shown in the image below as a green marker, on the far left). When you see the two-headed arrow, drag the arrow to the desired starting position for the audio clip. To trim the end of the clip, click the end point (shown in the image below as a red marker, on the right). When you see the two-headed arrow, drag the arrow to the desired ending position for the audio clip.